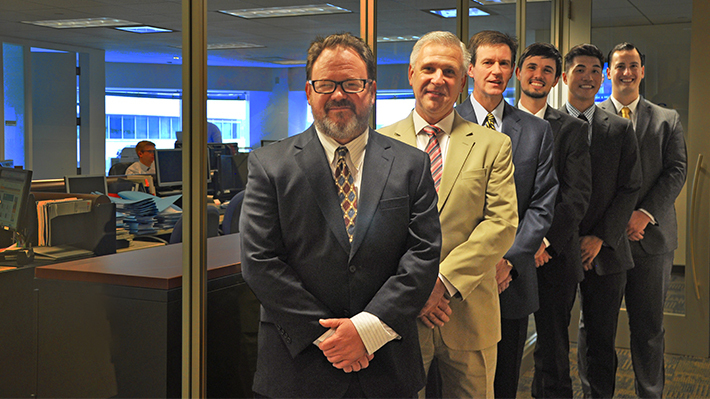 When we first wrote about alums and PNC mutual fund managers Doug Roman MS ‘89, Joe Jordan ‘78, Michael Coleman ‘12 and Mark Batty ’84, MS ‘89, in Market Street magazine in 2012, we boasted about their large cap funds’ performance: their core fund and growth fund both ranked in the top 15 percent of their respective categories. They knew they had a great strategy, but three years ago they couldn’t possibly have imagined this: Their large cap growth fund was the No. 1 best performing fund of its kind (among thousands of funds) in the 12 months ending March 31, 2015, having registered a 22.9 percent gain, according to the Wall Street Journal’s latest Winner’s Circle article. Roman, the fund’s managing director and lead portfolio manager, says his team’s key focus is on higher-than-expected earnings, because they believe earnings drive stock prices. His team has developed a model, the Large Cap Advantage Equity investment process, through which they successfully identify companies that will earn more than expected in a given quarter. “I often say we can beat the market because we are strict in following our process. One reason it’s so hard for actively managed funds to outperform is analysts falling in love with the stocks.” He says this disciplined approach can help to negate the negative effects of behavioral issues. The Drexel tradition among this team continues to grow, as former co-op student King Lee ‘15 will join them full time as a trade coordinator later this month. They also currently employ a Drexel LeBow co-op, Aaron Hartmann. The SEI Dynamic Asset Allocation Fund received honorable mention in this WSJ Winner’s Circle article. Drexel LeBow alum Jim Smigiel ’93 is the fund’s portfolio manager; he also serves as managing director of SEI’s portfolio strategies group. “We were only given an honorable mention because WSJ was looking for large cap stock funds, and this is not what we do. This fund is more global and macro-oriented. We are attempting to beat the S&P 500 by utilizing a broad range of capital market exposures,” Smigiel says. This is the second consecutive quarter that LeBow alums dominated the Winner’s Circle for large cap mutual funds. The PNC large cap team was first recognized for its performance by WSJ’s Winner’s Circle after the quarter ending Dec. 31, 2014, earning the second place spot with a 19.3 percent return. The fund that placed first, Glenmede Large Cap Growth Fund, is also co-managed by a Drexel LeBow alum, Vladimir de Vassal ’82, MBA ’87. It saw a 20 percent return. Roman says it’s “really quite the statistical improbability” that Drexel alums have run all three of the funds recognized by WSJ as being the top performers in this category for the past two quarters. Glenmede and PNC, the top two finishers in The Wall Street Journal Winners’ Circle contest, are managed by LeBow alums Vladimir de Vassal and Doug Roman. LeBow’s Dragon Fund had its best year yet in 2013, and it’s one of the largest student-management investment portfolios in the nation.